If you grew up in the 80s like I did, then you can finish the rest of that song. And you know exactly what movie it comes from: The Breakfast Club. I was 14 when the movie came out and suffering from teen angst along with the rest of my peers. Yet, that was exactly why The Breakfast Club resonated with many of us in Generation X. It was, for the first time, a teen movie that treated us–and our angst–as real and genuine. The 30th anniversary of The Breakfast Club’s release is happening now. The hulabaloo surrounding the anniversary got me thinking. If those characters endured teen angst with me, then wouldn’t they have been right there with me in the trenches through the parenting years? Did Claire the Princess or John the Criminal look around in amazement the first time they cleaned up a diaper blow-out? Did Andy the Athlete wonder why his baby wouldn’t stop crying? Did Brian the Brain know how to complete Everyday Math homework? Did Allison the Basket Case worry when her child couldn’t make friends? Brian is a local Scoutmaster and a Deacon at his church. Each year he enjoys “helping” his kids participate in the Science Fair. Last year he “helped” his eight-year-old daughter build a hover craft that won the local, regional, and state Science Fair titles for “Best in Show”. Andy has 2 sons who play travel football, travel basketball, and travel baseball. Andy is the head coach or assistant coach on all the teams and spends his summers shuttling the boys to elite sports camps. He has some kind of desk job that allows him to leave early nearly every day for his kids’ sporting events. Allison dabbled in homeschooling, organic homesteading, and extreme couponing before she found her niche as a mommy blogger. She has nearly 80,000 fans on her blog’s Facebook page and has been published on Huffington Post and Scary Mommy. She is working on a book. Claire is a stay-at-home mom. She volunteers weekly in her children’s classrooms and recently finished a term as the secretary of the PTA. She enjoys tennis at the club and belongs to the Junior League. John works hard for a living in the trades. A divorced father of one, John can be found at the local bar when he’s not watching his son play basketball. His son plays on the same travel basketball team as one of Andy’s sons. John still sees Claire around town. 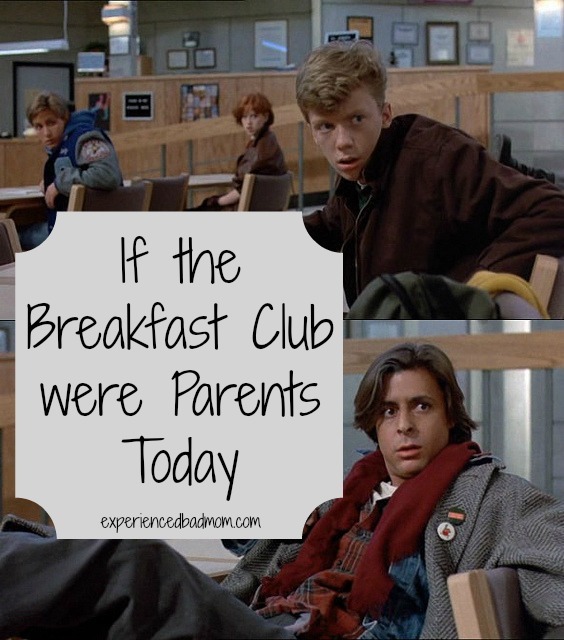 How do you think the Breakfast Club would have turned out as parents? If you’re not Generation X, then what movie defined your generation? Now you’ll have to excuse me. I’m off to look for my leg warmers, jellies, and Rubik’s Cube. I think I have a New Coke stashed somewhere around here, too. The Breakfast Club “looks” by Adg’s Screen Caps is used under a Creative Commons license. Text has been added. Choking with laughter here. Such a clever post idea chalk full of brilliant concepts. Oh man. I have to confess that I missed out on this gem of a movie the first time around. It wasn’t until my son got the heads up that he had to watch it that I saw it. We both loved it – even though we are from two distinctly different generations. Yup, this movie speaks to many generations! I’m glad your son has heard of it. And look at you, hip mama, watching it with him. You go, girl. Bahaha!! I love The Breakfast Club!!! Excuse me! This is a classic, ma’am!!! It’s not that great – I don’t get it. GASP! Good for you for appreciating this fine piece of cinema history. And for thinking of your husband, too! Best. Movie. Ever. Allison is a mommy blogger. Perfect! I have to go watch it now. I didn’t realize it’s been 30 years. I’m so old. Hilarious. About a year ago, we watched it with our girls who are now 17. They squawked and refused to watch. Then it was their new favorite movie. Same with Ferris Bueller. Sixteen Candles. This is a timeless film. I was a little older than you and I remember everyone wanting to dance like Claire. I recently saw an interview with Molly RIngwald where she didn’t even want to dance in that scene! It’s neat to think ahead that I can watch this with my daughter some day. And Sixteen Candles, too. I always wanted the dad in Sixteen Candles to be my dad. Oh Katy, this is BRILLIANT!!! SO funny and probably very accurate!!! Oh, how I loved that movie- do you know that John Hughs went to my school and actually Breakfast club is said to be from his experience there? He filmed all his great flicks in my town… I was an extra in one of the Home Alones (you can’t see me, I was in the crowd)!!! That first one’s church scene was filmed at my church and gosh, all of his movies have places I grew up in. Literally down the street. Isn’t that cool? They wanted to film that Breakfast club at our High School, but apparently they picked one in a different suburb, for what reasons I don’t know. Totally sharing this. I love your mind. Oh yeah, I do. Chris! That is soooo cool! Now that I live in the midwest I can appreciate how much the setting contributes to his stories. Back in the 80s, I lived in AZ and the scenery in those John Hughes movies did NOT look like the Phoenix area. Thank you so much for sharing! I ended up having quite a fun time on Twitter bantering back and forth with Plagued Parent and New World Moms because you shared, so thanks! I’ve seen this movie a time or two, but it wasn’t a defining movie for me. Growing up Top Gun and The Princess Bride were my favorites. I think I watched them every weekend! Rabia, I wuve The Princess Bride! Wuv, truu wuv! Recently I saw somebody’s making Maverick and Goose t-shirts. Too funny – and AWESOME! I don’t remember watching this movie as a teen bUT we watched it on Netflix recently. I didn’t really get the cult following it has but I think you explained it well that teens at the time felt understood. Love Claire’s and Allie’s predictions. Thanks for sharing with Small Victories Sunday linkup. Pinned to our linkup board and hope you join us again this weekend. This is so fun! I’ve never thought to consider what they’d be like as adults. Now I need to go back to all the teen movies I watched in the 90’s and do the same thing! Lauren recently posted…Does 3 Day Potty Training Really Work? NAILED IT! I think this movie did so well because as teens so many of us could see ourselves in one of the characters. I think even today your assessment will find most of us fitting in one of those categories. I love love love this article! I think you totally nailed it except I think John the criminal was the classic misunderstood Gen X’er that probably would’ve gone on to greatness in the late 90’s dotcom boom–and retired by age 35. Everyone would’ve been struck by surprised except Claire who secretly knew he had that potential all along.